Are you a fan of horrors and a very Easy Slot? 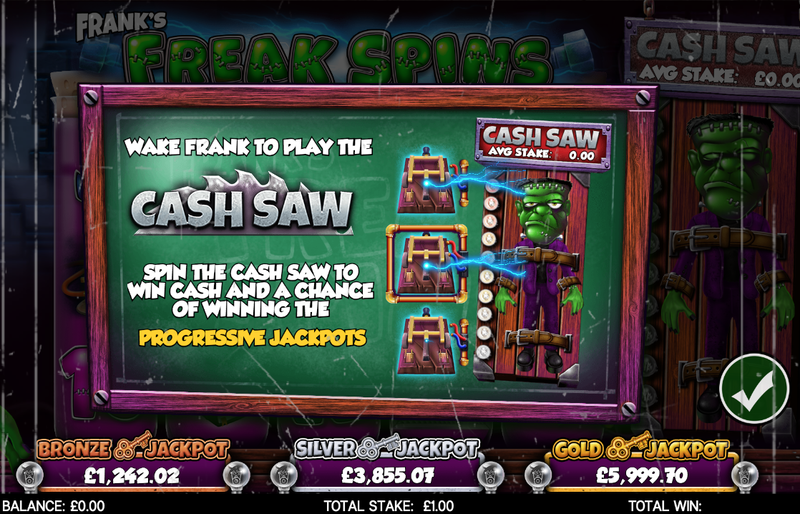 If you're prepared for a fright, then you will enjoy Franks Freak Spins, a 5 reel, 20 payline slot create by Core Gaming. Put on your lab coat and observe the crazy experiments performed by the evil Dr. Frankenstein. Franks Freak Spins has a horror theme with fantastically gruesome graphics and a spooky soundtrack to match. Features include wilds, multipliers and freaky free spins. This slot also has a range of additional features including a wake up the monster feature where you can win lots of great prizes. Core Gaming has been creating games for the iGaming industry for around 20 years. They are one of the leading game producers in the industry and have been around for 20 years, they know how to make the best games for all game players around the world to enjoy. With a combination of beautiful artwork, incredible industry knowledge, and the latest technology, Core Gaming creates something spectacular every time. They have a range of slots varying from classic fruit slots like Jackpotz and Egyptian themed slots like Pharoahs Wild. If you liked Franks Freak Spins, why not take a look at these spooky slots here on Easy? 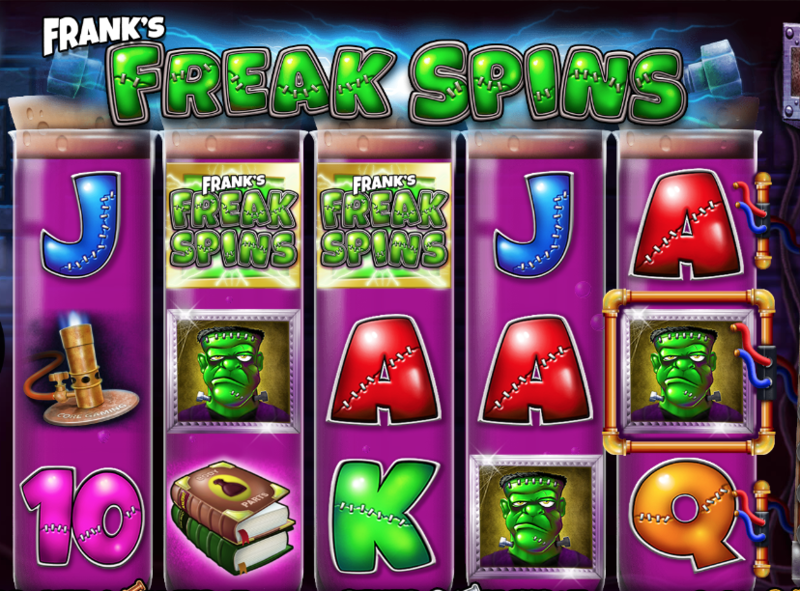 Franks Freak Spins is a 5 reel, 20 payline slot with a Frankenstein theme. If you're familiar with the classic tale of Frankenstein or love to feel spooked then this is the one for you. The graphics in this slot are very cartoon-like bursting with garish colours and freaky 3D animations. There's even an eerie soundtrack to add to the scary feel of the game. Behind the reels, you'll see a plain blue background. Symbols include bubbling potion bottles, a spell book, bunsen burners and Frankenstein himself. Freak Spins Bonus Builder Feature - Unlock the freak spins bonus feature by landing 3, 4 or 5 scatters on the reel. When the feature is unlocked, you'll be given 5 free spins and a multiplier of up to 3x. The next step is to select a potion bottle from the many magic potions lined up to unveil extra free spins, multipliers, and wilds. Gain 25 more free spins by landing 3, 4 or 5 scatters in this feature. Cash Saw Bonus Trail Feature - You'll find the monster meter on the left side of the reel. The aim of this feature is to collect as many elements as possible to fill up the meter. Land an electric switch symbol on reel 5 to gain 1 element to add the meter. Spin the Wheel Bonus - You'll know when you've activated the spin the wheel bonus as the meter with light up. Land on an upgrade to move to the middle of the wheel to have access to more exciting cash and multiplier prizes. If you love slots with a horror theme then you will enjoy Franks Freak Spins. The Frankenstein theme is spot on throughout the whole game from the gruesome graphics, to the monstrous features and spooky soundtrack. Play slot games by this developer today on Easy Slots!